TheStreet talked with the CEO about Cisco's push for gender and racial diversity in light of the sexist memo circulated at Google. A cascading number of events over the past several months have forced Silicon Valley to finally confront its long-standing issues with diversity and sexism. To name a few: There was the blog post from former Uber Technologies Inc. engineer Susan Fowler, which detailed the ride-hailing startup's systemically bad treatment of women and kicked off a series of investigations into alleged sexual harassment; then several female entrepreneurs came forward with stories of sexual harassment and predatory behavior from influential venture capitalists; and earlier this month, fired Alphabet Inc. (GOOGL - Get Report) engineer James Damore penned a sexist memo that circulated among employees, and later leaked, claiming that biological differences are behind the shortage of women in tech and leadership positions in Silicon Valley. And while the events have spurred a much-needed discourse about tech's problems with gender bias and inclusiveness, it remains unclear how Silicon Valley actually plans to fix many of its systemic issues. As part of a wide-ranging interview, TheStreet talked with Cisco Systems Inc. (CSCO - Get Report) CEO Chuck Robbins about what his company is doing to combat a lack of diversity among employee ranks and leadership positions and how the broader tech community can push forward from these issues in the future. Silicon Valley's issues with gender go beyond the hiring stage and back to when women and men are entering higher education, Robbins said. Fewer women are choosing to pursue college or graduate degrees in technical fields, he noted, which presents a big problem. Women hold less than 25% of jobs in the fields of science, technology, engineering and mathematics, according to the Department of Commerce. On top of that, women with a STEM degree are much less likely to work in a related occupation, instead choosing to enter education or healthcare. Cisco has placed a great deal of focus on recruiting diverse candidates, and also on retaining a diverse workforce, by trying to achieve pay parity between genders and creating employee resource groups. In turn, Cisco has fostered a workplace environment that encourages inclusiveness and representation of all people, which Robbins said he's pleased about, but he added that there's still "a lot more to do." 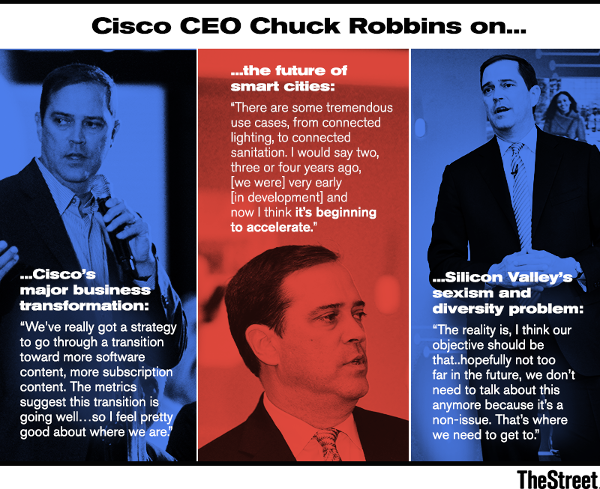 Cisco now has a high concentration of female and minority leaders, with diversity at the leadership level and diversity in the boardroom, Robbins noted. "I think we have been a leader in advocating for an inclusive environment and a diverse workforce," Robbins said. "Honestly, it's just good business, but for us it just happened naturally that the best people for those roles [also matched] what we were looking for on our board ... and that's the way it ought to be." Out of Cisco's 12-member board, four directors, or 33%, are women. Women make up about 22% of S&P 500 boards, and there are only 28 female S&P 500 CEOs, according to BoardEx, a relationship mapping service of TheStreet Inc. Five companies within the S&P 500 have yet to appoint a woman on their boards. Of Cisco's 73,700 employees in 2016, about 45% of them were nonwhite, while 54% were white, according to Cisco's 2016 Corporate Social Responsibility Report. That's practically flat from 2014, when 54.4% of Cisco's employees were white, but better than Hewlett Packard Enterprise Co. (HPE - Get Report) , where roughly 70% of employees were white and Google, where about 61% of employees were white. The report also showed that 76% of Cisco's employees are men. When asked what should be done in cases of gender bias, such as the memo circulated at Google, Robbins said it's on the company to take responsibility for the issue at hand. "I don't think it's very complicated," Robbins explained. "You have to bring in leaders from all backgrounds, every gender, every race, who all believe in it holistically. They have to walk the talk." Ultimately, Robbins hopes that in creating a natural cycle of diverse leadership and recruiting structures, issues of gender and diversity will eventually disappear. "The reality is that our objective should be that some number of years away, hopefully not too far in the future, we don't need to talk about this anymore because it's a nonissue," Robbins said. "That's where we need to get to."